Greg Horn is best known for his artwork on MARVEL COMIC’s titles ELEKTRA, EMMA FROST, and SHE-HULK. He is currently the regular cover artist on the acclaimed series MS. MARVEL by Brian Reed. On the licensing front, Greg’s art has been used on just about any piece of merchandise you can think of! 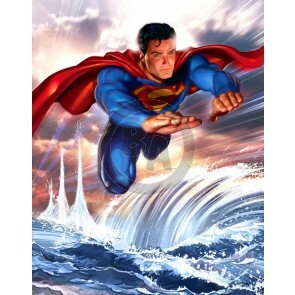 With WARNER BROS’ licensing division, Greg has provided spot illustrations based on the SUPERMAN RETURNS movie, and also an original painting for MATTEL’s board game Kryptonite Crisis. Other recent WB projects have included a Superman poster for CLAMPETT STUDIOS, and several illustrations of NBA star Lebron James for POWERADE and ESPN. Greg’s acclaimed work in comic books has opened up hundreds of fantastic opportunities in many different industries outside of comics. In the past five years he has lived an artist’s dream, working on high profile projects in advertising, video games, magazine covers, editorial, boardgames, and novels.